My wife is quite resourceful. 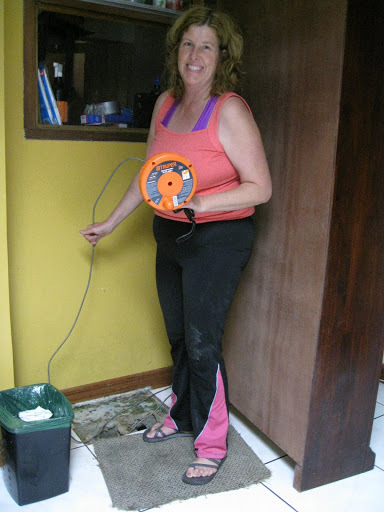 While I’m tramping around the Western hemisphere, she’s handling plumbing problems with her own tools. November is the last but also the heaviest month of rain during Costa Rica’s rainy season (May through November). This year was no different, but the plumbing finally had enough and the kitchen got the worst of it. True to Costa Rican ingenuity, there’s an access hole hidden by a tile behind a cabinet in the kitchen. From there most problems can be accessed. Don’t ask what is in the hole though. Suffice it to say a thorough shower was next on the agenda. I’m not sure this was mentioned in describing the commendable wife in Proverbs 31, but it sure fits in my interpretation.